Ford recorded a ten-fold year-on-year increase in Mondeo Hybrid registrations during 2018, reaching 10,000 units across Europe, as rising costs and political pressure continued to erode the business case for diesel engines. That rise in demand meant roughly one in five Mondeos registered across the region last year were hybrids, despite this drivetrain only being available in the typically slow-selling four-door saloon bodystyle. Responding to that growth in sales, the hybrid line-up will be extended to include a sporty ST-Line version, and the segment’s only hybrid estate later this year. It also means, for now, the Mondeo is unlikely to be discontinued, as Ford’s North American saloons have been, despite ongoing sales decline in that segment. The company is focusing on its most profitable product lines, dropping slow-sellers such as the C-Max MPV and expanding its SUV portfolio for Europe. This will include reviving the ‘Puma’ nameplate for an SUV positioned between the EcoSport and Kuga. De Waard hinted that the newcomer could match the Kuga’s 150,000-unit sales in Europe. However, the Mondeo won’t match the breadth of drivetrains being fitted to the new SUVs. 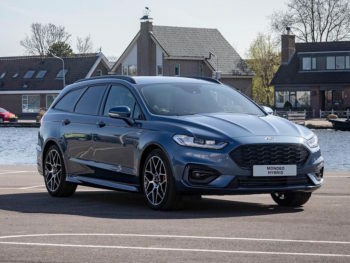 Ford has no plans to share the new Kuga’s plug-in hybrid system with the Mondeo, despite having offered its North American sister car, the Fusion, with this technology since 2013. De Waard said demand had been steered by legislation, and urged policymakers to re-think the latest diesel engines, as manufacturers work towards 2021’s EU-set 95g/km CO2 average: “The latest technology is very good, the [selective catalytic reduction] engines are super clean and efficient, but there are cities and countries that have decided diesel is undesirable,” he said.